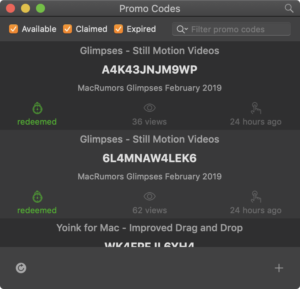 For my recent sponsorship of AppStories’ 99th episode with Yoink for Mac, iPad and iPhone, I also offered a couple of promo codes to the lucky first people who got to them. (Developers can create create promo codes for their app in the Mac- and iOS App Store, to give away to others so they can download their app for free. This way, members of the press can try out your app for free, or you can hold a give-away of your app). Some users find promo code redemption a little clumsy – and I agree. You have to copy the promo code, navigate to the iOS App Store (or Mac App Store, or iTunes on Mac for iOS apps), paste the code and redeem. I thought it would be nice to have a “landing page” for each promo code, where the user would be able to click a link and be taken to the correct redemption page with the code already filled in, or at least explain how to do it manually. It also occurred to me it would be neat to track promo codes – like their redemption status and expiration dates. Born was the idea for ‘Promo Codes’. 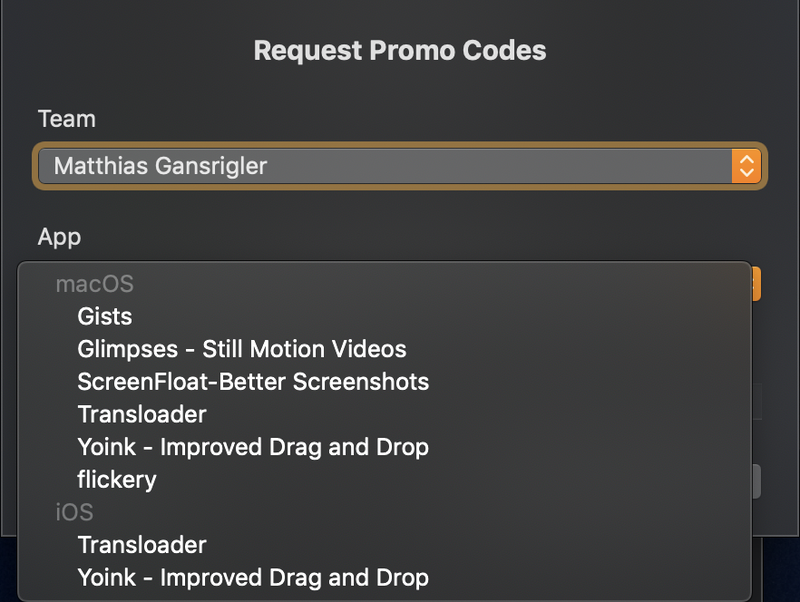 Of course, the whole thing would hang on my ability to be able to programmatically request promo codes from App Store Connect, but first, I wanted to check out the alternatives. Tokens is an awesome app that lets you do exactly what I detailed above (apart from an iOS app), and – although I haven’t used it personally – I can only recommend it, as I hear only good things, and it’s being recommend all over the place by developers. If you’re looking for a trusted, tested way of managing your promo codes – go try it out, they do have a demo! The other alternative was to forget about it and keep doing what I have been doing regarding promo codes – nothing. After all, I’ve been doing just fine not worrying about them at all ever since I became an indie developer. But what fun would that have been? I almost purchased Tokens, but for some reason saw a personal challenge in this, to see if I could pull off creating my own service. I wasn’t worried about the Mac/iOS side of the project. Rather, I was apprehensive about my server-side “skills” – of which I have none. I “know” a little PHP, and that just from piecing together code from tutorials and StackOverflow questions, as well as the occasional, small service script here and there (for example, to handle newsletter sign-up from my apps). Another big question mark was whether I could manage to programmatically create promo codes using App Store Connect – there wouldn’t have been much of a point in the apps if I wasn’t able to do that. And with that, I started looking into promo code creation. The credit regarding the REST APIs used here goes entirely to fastlane (github). Those people are doing amazing work and without their open source code, I wouldn’t have been able to do any of this – my code was pieced together from theirs. and get ‘authServiceKey’ from the JSON this returns – done. This is where it gets a bit more complicated. If you receive an HTTP Status of 200 in the response, you’re free to go to the next step (Retrieve the account’s session data) – the user either doesn’t have two-factor authorization set up, or the cookies are still valid from a previous session. Chances are, though, that you won’t get 200, especially now that Apple is enforcing two-factor authentication. So you’re more likely to receive an HTTP Status of 409. – Remember the response’s “x-apple-id-session-id” and “scnt” header values, you’ll need them for the next few calls. This will give us all the necessary information for proceeding – like the registered phone numbers (obfuscated, like you would see on the website, with ‘••••’ instead of digits). Depending on the information we receive here, we can also figure out if a code has just been sent to the user’s devices (or to a phone number), or if we need to request one. Otherwise, the user hasn’t set up any devices to be trusted with their login credentials or the account has more than one phone number which the user has to pick from for verification. In the latter case, we need to present the user with their obfuscated phone numbers, let them pick one and request a code via SMS for that number. which, if everything goes well, will return an empty response and send a code via sms to the user’s chosen phone number. Depending on whether the code was sent to a trusted device, or by SMS, the URL to call and the JSON body to send are a bit different. Call either of those with the usual headers and, if everything goes well, you’ll receive an empty response – otherwise, errors are returned (if the supplied code was wrong, for example). Now that we’re logged in, we can continue with our actual objective – requesting promo codes. First, we need to know what we’re dealing with – mainly, the teams the user is part of. which will give us a JSON response and everything we need to know – the current user info (“user”), the currently signed-in team (“provider”) and all available teams (“availableProviders”). In my implementation, I follow that call with another one to retrieve the currently selected team’s apps right away before updating the UI, but for the sake of this post, I’ll explain that in the following points. As the user might be part of several teams, we need to be able to change the currently selected team so we can retrieve its apps for promo code creation. This will update your session’s cookies so that the selected team is the active one. Let’s retrieve the apps for the currently selected team. It’s a simple GET call (with the usual headers) to ‘https://appstoreconnect.apple.com/WebObjects/iTunesConnect.woa/ra/apps/manageyourapps/summary/v2‘ and it’ll return a JSON with all the infos we need about the apps. Depending on the UI implementation, we’re particularly interested in an app’s id (“adamId”), its name (“name”), its bundle ID (“bundleId”), vendor ID / sku (“vendorId”) and the platform it’s running on (“platformString”). We can now present the apps to the user and let them select one. With a selected app, we can retrieve its promo code info – front and foremost, if there are any promo codes left to be requested for the current version. Knowing everything we need to know, we can finally request the desired amount of promo codes for the app. Careful, it’s an array this time, not a dictionary. Yup – that cost me a couple of hours. It would be convenient if the response would contain the desired promo codes, but sadly, it doesn’t. All it contains is whether the creation was successful or not. 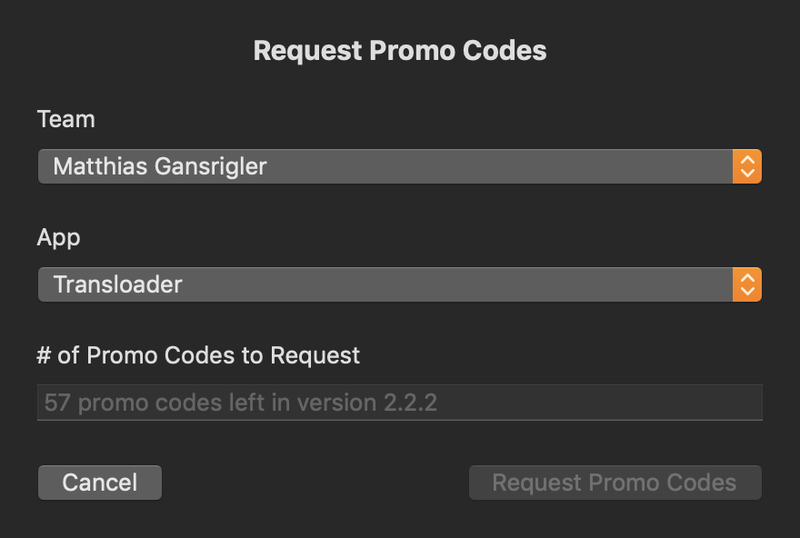 The promo code history contains all promo codes created previously and just now, so we need to know when we started the request process so we can filter out codes we didn’t just create. We call GET ‘https://appstoreconnect.apple.com/WebObjects/iTunesConnect.woa/ra/apps/<adamIdOfTheSelectedApp>/promocodes/history‘ and parse the resulting JSON. Specifically, we’re interested in the code itself, its creation- and expiration dates, its platform and version. You can find the source code (in form of a sample project) over at GitHub. Animated GIF is not a good video format. Actually it even isn’t a proper video format because it lacks random access and audio support. Nonetheless animated GIFs experienced a rennaisance in recent years. Given those constraints, GIFs are a great way to communicate simple concepts or interactions. Want to showcase an animation or an application feature? Instead of a static screenshot with paragraphs of text, a 3 second GIF works equally well and also draws more attention. In my daily life as software developer, I often need a quick way to capture graphical bugs. Those clips can be easily shared with colleagues or included with bug reports. Sometimes it’s also simpler to attach a GIF to customer support requests instead of explaining how a certain feature works. 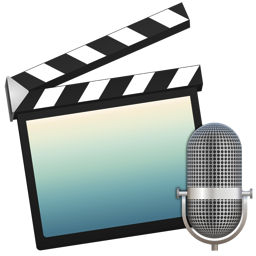 To cover my own needs, I wrote a small macOS application that allows me to record the screen and export the result as animated GIF. The app uses a custom recording codec and also covers the rest of the GIF creation workflow like crop, trim and file size optimization. You can download Claquette from the Mac App Store. For detailed product information, please visit our website. When I started to implement the Animated GIF feature for Claquette, I began with a naïve approach. Armed with several years of experience in writing Objective-C and some knowledge about video APIs on the Mac, I wrote a small prototype. That first version just read a video file frame by frame and sent the resulting frames to ImageIO. ImageIO is a system framework that supports reading and writing several file formats. It also comes with a basic Animated GIF encoder and so I decided to skip any third party libraries and just use the built-in mechanisms of macOS. I was able to come up with a working prototype in a single afternoon. The program was just a simple command line utility, but it was able to turn an arbitrary video file into an animated GIF. There was just one problem… Or actually there were several of them: Due to the inner workings of ImageIO, the program used vast amounts of memory. Also, the encoding took very long and the files it created were huge. On top of all that, the resulting GIFs looked horrible. So while it only took me one Sunday afternoon to create a working prototype, it took me several months to fix the above issues. Especially the large file size and the bad visual appearance of the resulting GIFs required a lot of research. The original GIF specification (GIF87a) was written in 1987 – almost 30 years ago. Animation features were added in GIF89a, which is still the most recent version of the format. So how is it possible that a file format designed for low resolution screens and 256 colors is still in use today? It turns out that the GIF specification contains some sections that open room for exploitation. Additionally, the visual nature of GIFs allows for optimizations to trick human color perception. Header and Trailer are basically just magic numbers that mark the start and the end of the file. The Logical Screen Descriptor contains some general image information like width, height and background color. The Global Color Table is a simple list of colors that may contain a maximum of 256 entries. Main image information is stored in one or more Graphic Control Extension blocks. The color table sections of the format specification are a good starting point to optimize the visual quality of an animated GIF. Both palettes are restricted by the format’s infamous 256 color limit. When reducing an image that uses 32bit (16.777.216 colors, 256 alpha values) to 8bit (255 colors, 1 alpha bit) it becomes really important which colors you leave out. The process of reducing large palettes to small ones is called Color Quantization. Choosing a good quantization algorithm is crucial when aiming for visually similar images with a reduced palette. Naïve quantization implementations are based on occurrence, where seldom used colors are left out in the final image. More elaborate algorithms use techniques like dimensional clustering or tree partitioning. When developing for Apple devices there are several libraries that provide color quantization functionality. macOS and iOS even have basic color quantization algorithms built-in. Apple’s implementation is part of the ImageIO framework’s CGImageDestination API. The following sample images were created using different quantization techniques. They illustrate the quality impact of the used algorithm on the final image. The first image shows the output of CGImageDestination. The resulting colors are noticeably off. Apple’s encoder also messes up the transparency color in the GIF palette, which leads to holes in some areas of the image (e.g. the titlebar). The open source library FFmpeg also includes a color quantizer. FFmpeg produces way better results than CGImageDestination. The colors are more vibrant and the transparency color is set correctly. The color quantization library used by Claquette also outputs a good choice of colors. Additionally the app performs color matching to avoid color shifts and to guarantee correct gamma values. Another important factor during GIF generation is efficient frame difference calculation. The disposal mode in the Graphic Control Extension allows an encoder to specify how the context is set up before the next frame gets rendered. Unspecified: Replaces the existing canvas with the full contents of the current frame. Do not Dispose: Leaves the existing canvas as-is and composites the current (sub)frame over it. Restore to Background: Sets a defined background color and draws the current frame. Areas outside of the subsection in the Image Descriptor shine through. Restore to Previous: Fully restores the canvas to the last frame that did not specify a disposal method. The Image Descriptor section can be used to define a sub-image which does not provide pixel data for a full frame. Instead it contains coordinates and pixel data for a subsection of the full image. By using frame differences and sub-images with a proper disposal mode, redundant image data can be avoided. Depending on the nature of the input video, this can greatly reduce the file size of the final GIF. Modern video codecs like H.264 use techniques like macro blocks and motion compensation. Those methods introduce small errors that propagate from frame to frame. Propagated errors show up as noise when calculating frame diffs and eventually lead to unnecessary large files. Claquette uses a custom lossless codec, that only stores regions that actually changed. This guarantees exact frame diffs. The following images show the difference between frame #1 and frame #2 of a screen recording. The only effective change between those frames is a change in the mouse cursor location. An exact diff should therefore only contain an offsetted cursor image. The above diff image was created between 2 frames of an H.264 encoded movie. The visible noise is a result of intra-frame encoding errors. The second image was created by Claquette’s image diff algorithm. It only contains the mouse cursor – The only image element that actually changed between frame #1 and #2. After implementing technical details like encoding and optimization, there were still some features missing. Claquette needed an editing UI to handle the whole GIF creation workflow. As I wanted to keep the app lightweight and simple to use, I decided to add only a small set of editing capabilities: Trim and Crop. Claquette uses AVFoundation, and therefore I was able to use the AVPlayer class, which comes with a built-in trim tool. Crop functionality was a bit harder to implement. AVFoundation doesn’t provide any UI component to display crop handles so I had to implement my own. Besides the standard drag & move interface, my implementation also provides some unique features. It offers alignment guides with haptic feedback and the possibility to enter crop coordinates. To launch the animated GIF feature, I prepared a press kit and wrote mails to review sites that mostly cover Mac software. Additionally I submitted the app to Product Hunt and informed Apple’s App Store Marketing team. I can really recommend to launch on Product Hunt: Claquette received over 400 upvotes and finished in the top 3 on launch day. The site also hosts a friendly community, that makes extensive use of the Q&A section below each hunted product. I was also lucky to get some mentions from high profile Twitter users and good App Store reviews. Two weeks after launch, Apple suddenly moved Claquette into the “New and Noteworthy” feature section on the Mac App Store front page. Of course this also lead to a noticeable spike in the sales charts. Overall I was very pleased with the release and the reception of Claquette 1.5. Thomas Zoechling is an independent software developer living in Vienna, Austria. Besides working on his own products, he is also doing contract work. Currently he is helping IdeasOnCanvas to develop the excellent mind mapping software MindNode (macOS, iOS). 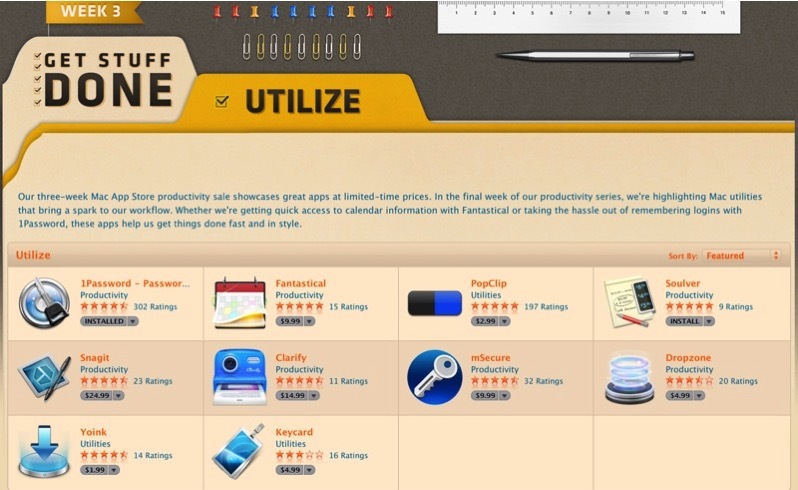 From January 21st to January 28th, Apple ran a promotion on its App Stores: Get Productive. 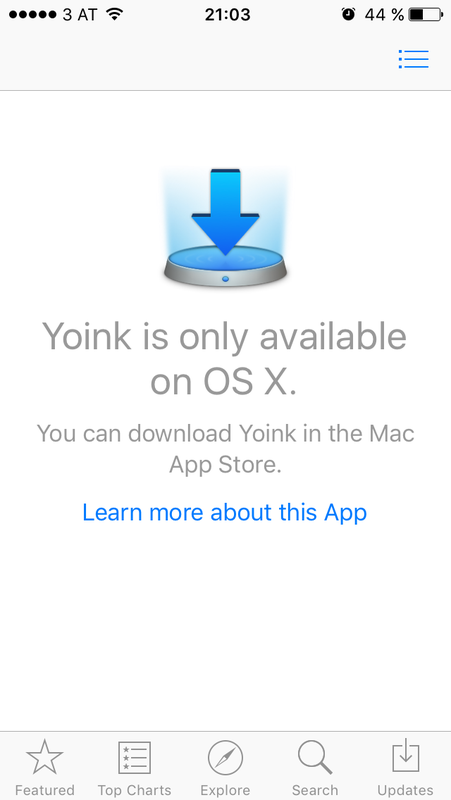 I was lucky enough to be asked to participate on the Mac App Store with Yoink, my app that improves and simplifies drag and drop on the Mac. I thought I’d share my experience with this promotion and some of the stuff that went on behind the scenes. It started at the beginning of January, when I received an eMail from a very nice person at Apple, asking if I was interested in putting Yoink on sale for a promotion to happen later in January. I didn’t think too much before responding that I would love to participate – after all, when Apple asks you to participate in a promo, you participate in that promo, there’s no question about it. It’s not the first time the app partook in a promotion. Thankfully, Yoink did pretty well in that promotion and I think that may have helped in making Apple consider it for this promotion, too. In case you’re wondering, I don’t have any access or connections to the powers-that-be of the Mac App Store. However, I do contact them (very rarely, mind you) through iTunes Connect ahead of time if I have a substantial update coming out with information about what’s new and what technologies are used in the update. I do not recommend contacting them about every update you put out – that can only be bad for you, I’m sure. I realize I should be counting my lucky stars getting one app featured in this promotion. The thing is, I really believe that another app of mine – ScreenFloat, which takes screenshots and puts them in front of all windows so they’re always visible as a reference to whatever you’re working on – would have been a good fit for the theme of “Get Productive”. In my mail to Apple, I mentioned ScreenFloat, described it in one sentence and asked if it would be considered. They did, but the app apparently didn’t make the cut. Since that was what I was expecting anyway, no harm was done and as far as I can tell, they didn’t find it too pushy. Quite the contrary; they seemed very thankful for the suggestion. I think perhaps the reason they decided not to include ScreenFloat in the sale was its lack of localization – ScreenFloat is localized in English and German, whereas Yoink is available in English, German, Japanese, Simplified Chinese, Korean, Portuguese (Brazil and Europe), French and Italian. Or maybe that it hasn’t received an update in a while (although I am working on version 2.0 these days). As you’re probably aware, when you release an update on the App Store, its current reviews vanish, the star-rating is averaged over all versions and the new version has 0 (zero) stars. I generally dislike withholding an update to my apps (as I regularly fix bugs and I don’t like knowing that a version with bugs that I have already fixed internally is still out there for users to use), but in this case, I had to make an exception. It came as a blessing in disguise anyhow since it gave me some extra time to test the soon-to-be-released update and make sure the new Force Touch integration was working as expected. I am more than happy with the results of the promotion. Then again, there’s bound to be a big impact on sales when Apple puts your app (along with other developer’s) in front of (potentially) all Mac App Store users. Apple calls users to action beautifully (see the first image of this post) – a nice banner with icons of popular apps along with the tag line “limited-time prices”. I know that gets me pushing the Purchase button. As expected, I noticed a significant jump in sales during the promotion. James Thomson, developer of PCalc (Mac / iOS), which also participated in the promotion, has also shared his curve on twitter. When the promotion began, Yoink was not in the Top 100 of the Top Paid category in the US at the time. On January 21st, the app started rising, went to the 43rd place, and on January 22 had its best spot at position 13. It hovered around that spot until the end of the promotion a week later. It rose to the Top Paid Top 10 in several countries, including China, Japan, Germany and Austria. I did not see a significant increase in the number of reviews – however, the ones I did receive during the campaign were written in China – something I attribute to the fact that, with a recent update of Yoink, I localized it into Simplified Chinese. I haven’t gotten many reviews of Yoink in that country before, so that’s a safe bet. 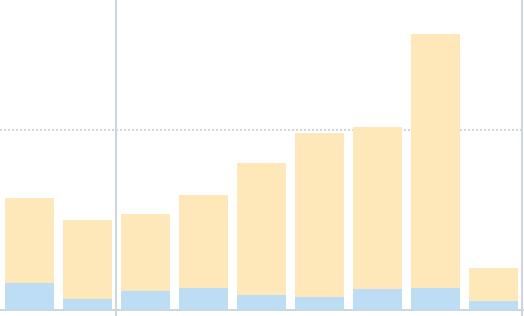 Surprisingly, requests for support (by mail, twitter or facebook) didn’t come in in the amounts I was expecting and I think that’s a good indication that Yoink is working reasonably well. Not getting support requests can mean two things: No one purchases it or the software is working more or less without major problems. Regarding the amount of copies sold, I take not seeing a big bump in support requests as a good thing. As I mentioned on twitter, I gave Promoted Tweets a try. I put €200,- (around $215) into it and I think it’s safe to say that it’s the most expensive way for me yet of reaching people. On the other hand, the targeting is first-class. I hand-picked 100 twitter accounts that I thought were relevant to the Mac community (developers, app-accounts, bloggers, journalists), chose interests that I thought were relevant to Yoink and let it fly. I reached 55.813 people, resulting in 4.142 “engagements”, a conversion rate of 7.4%. For $215, I can get banner ads on websites that yield 170.000 views and up, but the engagement rate there is much lower. What is an “engagement”, exactly? It’s a click on the tweet, a click on your profile, a click on the image, a click on the link, a “like” or a retweet. So the engagement rate of 7.4% itself is more or less meaningless. According to Twitter, I received 35 direct clicks on the link. Thirty-five. That’s an engagement rate of 0.06%. Pretty expensive advertising indeed. I ended up on a couple of lists with the specific purpose of blocking me, since I had an ad on twitter. Granted, those were most likely Twitter users who weren’t ever inclined to purchase my software and there are no hurt feelings, I just found it funny. 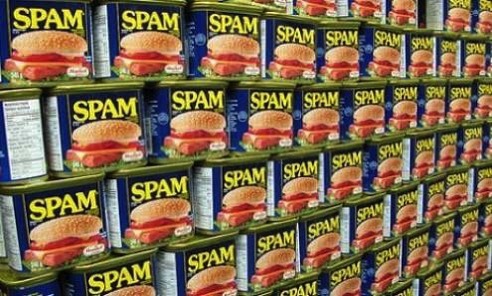 Seems some users on twitter don’t realise there’s advertisement and figured I spammed them somehow. 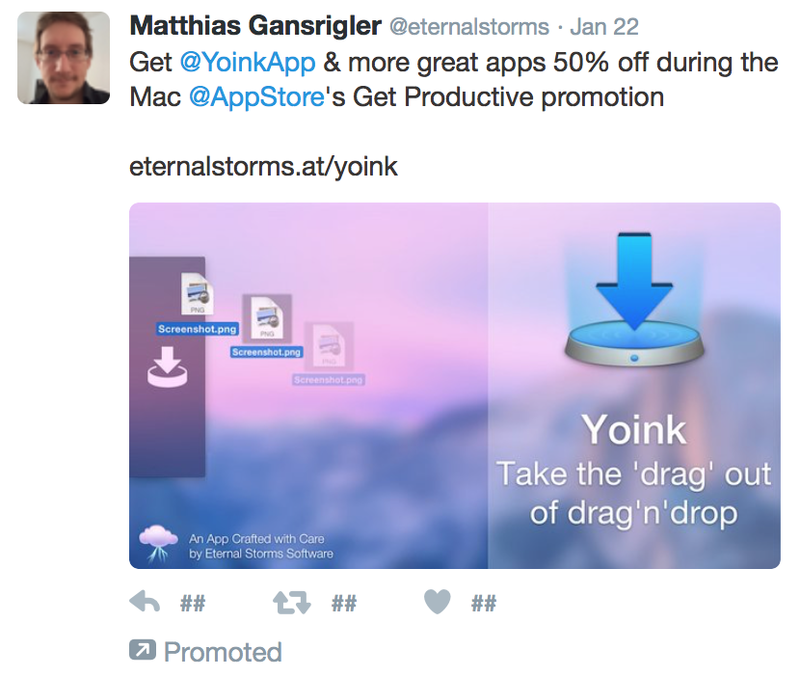 In the beginning, I ran a tweet with a link directed to Yoink on the Mac App Store, which later on I discovered was a bad idea. When you click on “Learn more about this App”, it does take you to the app’s website, but that’s another tap most users are not willing to do. I changed the link to take them directly to Yoink’s website and only lost about 4.000 views. My bad. (I filed a radar to improve the “Mac Apps page in the iOS App Store” here). I didn’t like linking directly to my app. I’d rather have linked to the sale, the promotion page where all apps are shown. As far as I can tell, however, that is not possible as of yet (I filed a radar for it, too). It is definitely something that could be improved for future promotions. Maybe the sponsored tweet may have raised the awareness of Yoink among some users, but I don’t think it was worth it. Perhaps an even more targeted audience would have helped. Being featured by Apple seriously helps you in getting new customers for your app and I’ll do it again any time they invite me. Sponsored tweets? Quite expensive for little to no effect (in my case – mind you, it was my first sponsored tweet and I might not have targeted it right. Next time, I might go for a sponsorship of a popular blog instead). If you enjoyed this blog post, perhaps you’d like to join the Eternal Storms Software Newsletter where I write you once a month at most about what’s going on with my apps and on my blog 🙂 Thank you.